Chevron goes ex-dividend on Wednesday with another 11% payout boost under its belt. 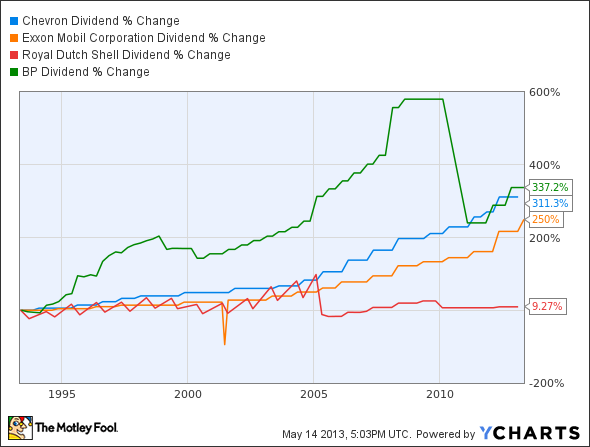 Here's how the oil giant's dividend policy helps Chevron shareholders in the long run. The black gold still deserves its rich name. 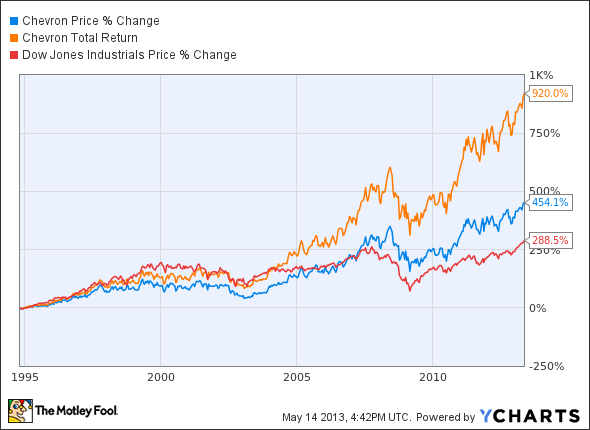 Chevron powers its generous dividends with outsize cash flows. The company's dividend boosts have left fellow Dow component and cash machine ExxonMobil (NYSE:XOM) in the dust, even though Exxon's cash flows are an order of magnitude richer. Chevron hasn't suffered any massively damaging setbacks like BP 's (NYSE:BP) Deepwater Horizon disaster, which put a damper on that company's market-crushing dividend increases. Royal Dutch Shell's (NYSE:RDS-A) total payouts plunged when the merger of Royal Dutch and Shell was completed in 2005 -- and have stayed modest ever since. CVX Dividend data by YCharts. Simply put, Chevron's smooth execution is second to none, and its shareholders are enjoying the cash-based benefits. The company just implemented another 11% dividend increase, set to take effect when Chevron shares go ex-dividend on Wednesday. Buying now would get you started on a healthy dividend-reinvestment program right from the start -- and you've just seen the market-beating difference that habit can make.